02/09/2019 - Riley Barber tied the game with 96 seconds left, and the Hershey Bears came back to beat the Charlotte Checkers in a shootout, 3-2, on Saturday night at Giant Center. 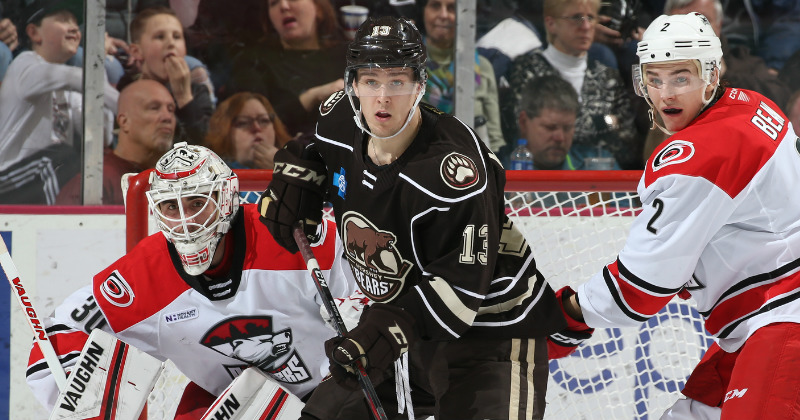 The victory extended Hershey's current winning streak to five games, and point streak to 11 (10-0-0-1). Into the third period, the Checkers grabbed a late 2-1 lead courtesy of another special teams goal. On Hershey's third minor penalty of the frame, Jake Beam took advantage and blasted his 10th goal of the season at 12:48. In the final two minutes, Vanecek vacated the Bears net in favor of the extra attacker. Barber sent a crowd of 9,182 at Giant Center into a frenzy with his 20th goal of the season in a clutch moment. Sudden-death overtime for five minutes did not solve a final result, and the third meeting of the season between Hershey and Charlotte progressed to a shootout. Scoreless into the fifth round, Nathan Walker scored the eventual game-winner, followed by a Vanecek save to ice the win. Hershey's record improved to 25-20-0-3 in the win. Final shots were 34-25 Charlotte. The Bears power play finished 0-for-4, and 3-for-5 on the penalty kill. The Hershey Bears and Charlotte Checkers rematch tomorrow, Feb. 10 at 5 p.m. at Giant Center in the season-series finale. It's Chocolate-Covered February Night at the game, and all fans will receive candy upon exit, courtesy of The Hershey Company. Ticket information is available online at HersheyBears.com.